Joe Crawford blogged this at 11:16pm in 2008 in March. The 18th was a Tuesday. You are reading this 11 years later. Comment. There are 5 comments Tweet. Send email. It has hashtags→ fire freeway los-angeles . The westbound side of the freeway was still closed when I drove by it to work this morning (5am’ish). So this was around midnight, I’m impressed that it was still there five hours later. I was probably a few minutes off from being part of a bad accident. Scary. “Authorities say a wrong way driver caused a fiery crash that has killed a motorist and shut down a freeway for hours in the Porter Ranch area. “Police say the crash on the westbound Ronald Reagan (118) Freeway happened at 11:35 p.m. Tuesday when a vehicle crashed head-on into a tractor-trailer east of Reseda Boulevard. 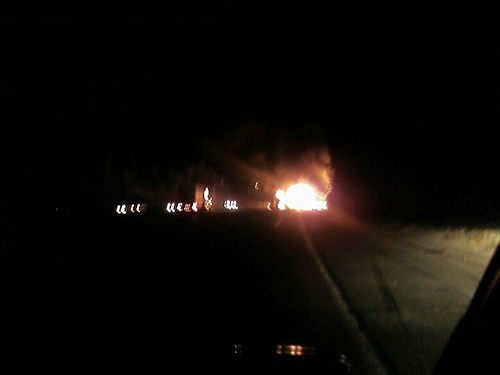 The big rig burst into flames, along with an SUV. “Before emergency crews arrived, explosions rocked the burning trailer truck and fire raced through brush on the northern embankment. “Dozens of motorists, who moments before had attempted to pass the burning wreck, turned around and fled driving the wrong way on the freeway to escape. “Fire officials say one motorist was killed and two suffered minor injuries. “At least three vehicles were involved in the crash. But on the plus side, it sounds like you’ve used up some bad karma and there’s smooth driving ahead for you. I saw the Twitter from the LAFD, but didn’t even think that you might still be headed home at that time. It sounded like a major accident and now I see that it was.